Home » Featured » News & Updates » Are You Ready for #PCB2016?! Students are gearing up once again for Spring Break in Panama City Beach and we want you to cash in on some important savings opportunities… but only for a limited time! The 2016 Panamaniac VIP Club Card is on sale now at an amazing discount, but only until February 15th. Thousands of cards will be sold this coming season to students from all over the country. It’s the card that simply takes care of all your plans! Free Spring Break 2016 Souvenir T-Shirt! If saving money is among your main priorities, the Panamaniac Club Card is what you need. Why pay those over-priced cover charges if you don’t have to? 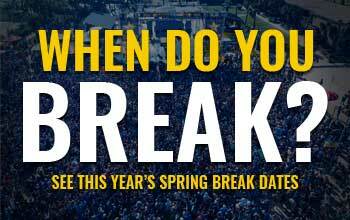 Avoid the rush when you get on the beach and purchase your 2016 Spring Break VIP Club Card in advance right here! The Beach Bash Music Fest – Spring Break’s ultimate beach event – is once again going to blow everyone away this year, and tickets are on sale at discounted prices until February 15th! This mega live concert festival showcases popular national music acts performing to massive crowds right on the beach. The 2016 Beach Bash Music Fest will take place March 14-16 and features the return of Steve Aoki on March 15, Brett Eldredge on March 16, Dannic in an official Pre-Party event on March 14, and Red Cup Nation in the official After-Party on March 16! Get discounted tickets for this event right here!